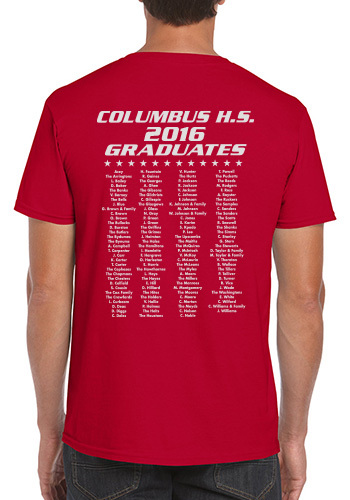 For the past 30 years USA Tees has been supplying graduation shirts across the nation! To join the Signature Tees School Program, please fill out the brief questionnaire below. USA Tees will mail out a price quote, color swatch book, template where the students can sign their names, and more! Mail back the template with all the signatures, correct sizes, school name and color and we will get them printed and ship time to you for free! Enjoy & congratulations to the graduating class! Your request for a USA Tees grad packet has been submitted. A packet will be mailed out to you and will arrive within one week. If you do not receive your packet within one week please contact USA Tees at 1-800-872-4449. Need our graduation packet in a hurry? The downloadable packet features all of the information you would find in the mailed out packet including our pricing sheet, mailing instructions, class of 2017 template, swatch book, and quote form all ready to be printed. You can then scan the forms back to us, or mail the printed out package.